This full facepiece respirator offers reliable, convenient respiratory protection, lightweight comfort and ease of use. To provide protection against particulates and a wide variety of gases and vapors, this medium size, reusable respirator must be combined with 3M Particulate Filters or Cartridges in its bayonet holder or dual airline system. It is not designed for use in environments that are immediately dangerous to life or health. Unique center adapter directs exhaled breath and moisture downward, helping reduce debris from depositing in the valve, and allowing quick, easy cleaning. Large lens provides a wide field of view and excellent visibility. 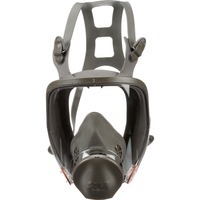 Lightweight, well balanced design features a bayonet connection, four point harness type, 3M Cool Flow Valve for cooler, drier comfort and silicone face seal for enhanced comfort and durability. Respirator is designed for use with 3M Cartridges 6000 Series 3M Filters 2000, 2200, 7000, 5000 Series or 3M Dual Airline Systems.